This is the hat I made Kyle. He loves it and so do I. I already started making myself one, but then set it aside after he gave me my new DSLR for Christmas. So instead of knitting and crocheting, I've been snapping pictures. Most of them aren't as blurry as this one though. This is the only one Kyle approved for use on the internet. 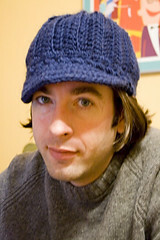 This is the "Lively Up" hat from Get Your Crochet On!. The description says it's the designer's version of an old school Kangol hat. I made the version with the bill for Kyle, as per his request, but I'm making myself the one with the brim. It looks really cute on him. I joked that all he needs was a Vespa to look perfect. It's got kind of that hip, mod, horse-racing-jockey vibe to it. I used that wretched Brown Sheep Lamb's Pride Bulky. Bleecch!! I can still feel the mohair clinging to my face. Hopefully it will get cold enough for Kyle to actually wear the hat outside sometime soon. It's 66˚ in New York on the first of December. Kyle brought in the hat to work the other day and showed it to me. It's great! I can relate to gagging on yarn---not fun!---but having seen the hat up close, I can say the yarn is quite beautiful as is your work. (I'm allergic to wool and sometimes I have to put down projects for weeks because my eyes get itchy and watery.) BTW, great photo, Kyle. On another note, P&S is closing after 25 years! Those on their mailing list---are you on it?---received advance notice of the sale, which began yesterday and will run through the end of the month. Time to stash up! Sorry for the double-posting. I constantly amaze myself that I've been working in technology for over 20+ years and always manage to botch up something as simple as posting to a blog! You are too cute in all of your hats. Not many people can pull that off. Did you knit the sweater too?